Comfortable & affordable 1 bedroom condo near 5th in the best location of Playa! The condo has everything you need for a relaxed vacation in a perfect location! The condo has everything you need for a relaxed vacation: wireless internet, cable TV in the bedroom and living room, a fully equipped kitchen, a comfortable seating area, a bathroom with typical Mexican talavera tiles and sink and a large sunny terrace overlooking the pool, where you can unwind after a long and 'tiring' day at the beach or a visit to the Mayan ruins. Next to the building you will find one of Playa’s nicest coffee shops, as well as countless restaurants and bars to choose from. Even though the condo is very centrally located, it is located on quiet side street off Fifth Avenue where there is little traffic or noise at night. Linens and (beach) towels are provided and weekly cleaning is included. This condo is located on Calle 30th, between Avenida 5th and 10th. It is literally around the corner from one of the nicest parts of the Famous 5th Ave.
Mamitas and Kool beach clubs are just 3 blocks from the condo. The building has a few off street parking spaces but they're not assigned to any condo in particular so if they aren't occupied you can use them, otherwise you can park for free in the street. Our 1week stay was amazing in this great condo, only few blocks from the beach. The condo was very clean and comfortable with out two small children. Propty manager was very friendly and helpful. We will definitely stay here again. This is a nice condo with a great location. You are a block away from 5th avenue, with all of the shopping and dining you could want. A few blocks more (5 min walk total) and you are at the beach. The condo was clean and comfortable and had every amenity you could need for a week's getaway. The best part was the customer service from Monica. She was very professional in all of our correspondence leading up to our stay, and she actually came to our rescue during the stay! We had lost our set of keys at the beach one night, and Monica came from the middle of her dinner to let us back into the condo to retrieve our spare set. She was there at the condo within twenty minutes of being called (at 9:30 pm!). No hidden fees. We were returned our full security deposit. Really enjoyed our 10 day stay at the well equipped Casa del Sol over Easter. The location was just great with only a few steps to 5th Ave and all it has to offer with restaurants and shopping and only 2 blocks from the fabulous beach. The Easter week was very busy including thousands of people on the beach but as crazy as it was we were able to enjoy quiet times in the lovely yard area at our poolside at the condo. The condo was comfortably set up and well cleaned and if there were ever any issues arise the agent looked after them immediately. Would certainly reccomend this property as a very good value in a great location. It was definitely the right decision to choose this appartment. Clean and well equipped kitchen & bathroom. And with its very central location (very close to the beach and steps from 5th avenue) we did not have anything else to do but ENJOY!!! 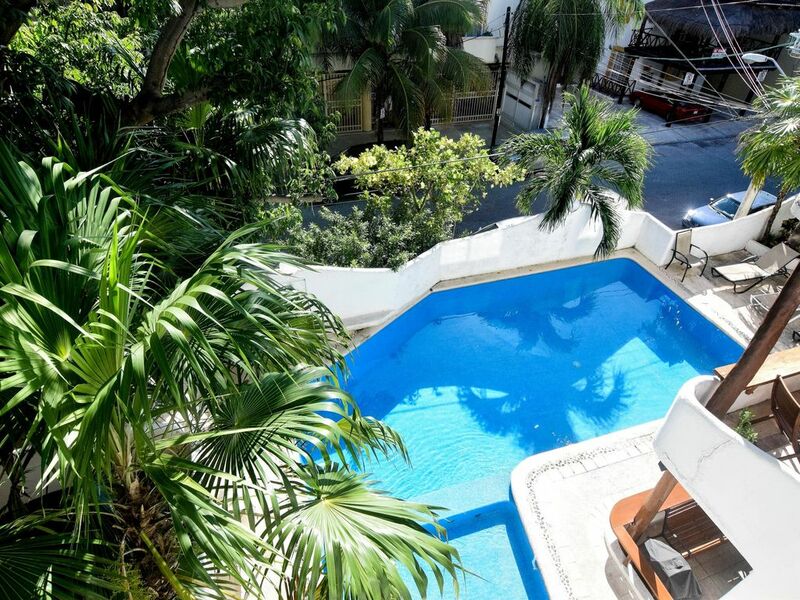 We loved our stay in Playa del Carmen at Casa del Sol, We stayed in Acacia 1 bdrm condo. Everyone we met was so friendly, we felt like it was our home. The location was great, close to the beach, steps from 5th ave, taxi's, and great restaurrants right outside the door, and wal-mart and Mega[grocery store+] a couple blocks away.We especially liked the cosy homey feel of the condo with it's big balcony and hammock out on the deck overlooking the pool. This was a big plus as my kids were in it any time we were at home. Best of all was Taz the buiding mascot [golden retriever] there to greet you when came in the gate at the end of a busy day. Will definitely be back, and highly recommend it. Monica was friendly,professional and a joyto deal with. You will have no regrets. We really enjoyed our stay. Simple, clean, and comfortable. Great location, right off 5th Ave and a quick walk to shopping, restaurants, and the beach. Monica, at Latido de Mexico, was very helpful with all our questions, from our first e-mail to the end of our stay! We would definitely stay here again.